You never know what you’ll find around the corner in the Wolverine State. Mountains, ice caves, oddly shaped shorelines, and more await the most intrepid travelers looking for something new and exciting to experience. If you want to dive into some of the best hidden gems and natural wonders of our state, you need to explore some of the top attractions in Michigan’s Upper Peninsula. Whether you want to see the second largest waterfall in the eastern portion of the U.S or watch the Northern Lights perform a magical light show, you’ll never forget the memories you make during a trip to the UP. For more things to do and places to see around our great state, request your free Michigan Vacation Guide! The Porcupine Mountains provide visitors with some of the best hikes in the entire state of Michigan. With miles of trails, several picturesque lakes, and Lake Superior bordering it to the north, you can easily spend several days exploring this vast maze of trees. Autumn is the prettiest time to hike the state park due to the myriad of bright foliage. Make sure you stop for breathtaking views at the Lake of Clouds Overlook. Pictured Rocks National Lakeshore is one of the most well-known attractions in Michigan’s Upper Peninsula, and rightfully so. Rent a kayak and journey along the miles of towering archways and smoothed rock shoreline, where you’ll find small waterfalls pouring into Lake Superior! Tahquamenon Falls is the second largest waterfall east of the Mississippi River (only behind Niagara Falls). It’s simply breathtaking to watch the long veil of water crash into the river 50 feet below! The main parking lot is steps away from the viewing platform for the lower falls, but you can take a ferry to the island for a better look at both the lower and upper falls! One of the little known Upper Peninsula attractions in Michigan, Isle Royale is an untamed wilderness that is perfect for those who want to explore off the beaten path…literally. Isle Royale lies off the coast of Canada and is only open from mid-April to the end of October and visitors. Hiking, kayaking, and wildlife viewing are the main ways to see the beautiful cliffs and thick forests around the island. Home to Michigan’s premier snowmobile race, the International 500, it’s safe to say that Sault Ste. Marie takes its snowmobiling pretty seriously. This unique UP town, sitting on an island on the St. Mary’s River, provides visitors with a wide variety of brewpubs, restaurants, and wineries to relax at before heading out along the 100 miles of backcountry trails. The Eben Ice Caves are some of the most unique attractions in Michigan’s Upper Peninsula. Pack your snowshoes and head out for a winter hike near Silver Creek in between Marquette and Munising. This network of frozen caverns is an unbelievable sight, so bring your camera and be careful of icy areas. The Northern Lights in Michigan? Yes, you read that correctly. Watching the Aurora Borealis from the Wolverine State is arguably the most breathtaking attraction in the Upper Peninsula. Most areas bordering Lake Superior provide fantastic settings for watching this natural light show (try the Marquette area). You can typically view the Northern Lights in the winter, but they occasionally spill over into the spring. Here are some tips for watching the Northern Lights in the UP! Find Your Perfect Freshwater Vacation Rentals Home! Here are Freshwater Vacation Rentals, our goal is to help you find your home away from home in Michigan! 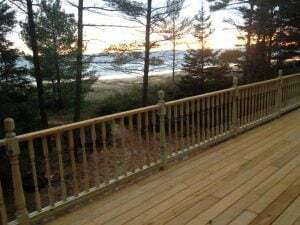 We have an extensive list of Upper Peninsula rental properties that put you close to some of the best attractions in the area! If you want to explore more attractions in the UP, take a look at our special things to do page! Ready to start planning the vacation of a lifetime? Book your rental today! We look forward to welcoming you to our adventurers paradise!